In summary: New York City had a life of it’s own in my head. In early August 2016, I visited there for the first time. On the first afternoon we visited Central Park and were there for hours, despite the jet lag. Day One started with a tour of the Intrepid and the Space Shuttle Enterprise, followed by the full two and a half hour cruise around Manhattan – south down the Hudson River into the Upper Harbor, up the East River under the “BMW” bridges, past Midtown and the UN, into the Harlem River, back south into the Hudson River, underneath the George Washington Bridge, past Grant’s Tomb, and finally back into port. To finish Day Two we had a death march to find a cab, went to the Mets game, left early only to miss the best part, and inadvertently stiffed a nice cab driver. Bright & early on Day Three we headed out toward Liberty Island – it’s hard to take a bad picture there. 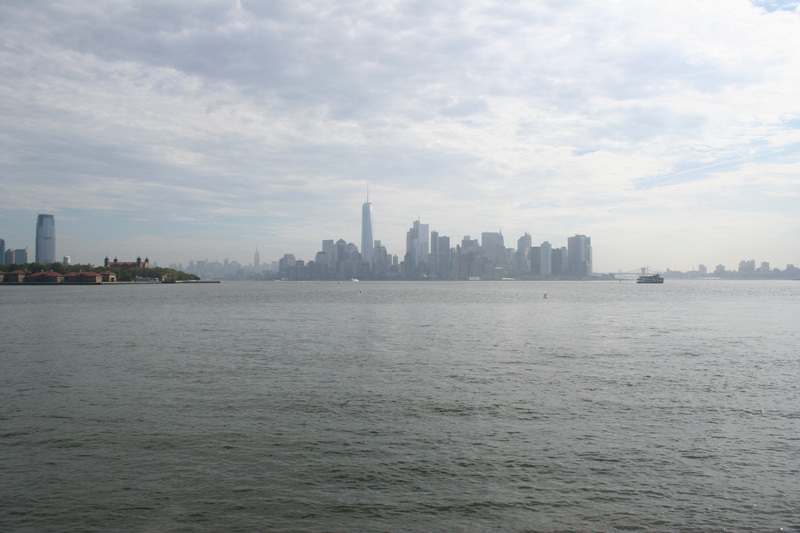 From Liberty Island, the skyscrapers of Manhattan look like a mountain range rising out of the sea. In the haze over on the left you can see the Goldman Sachs Tower. 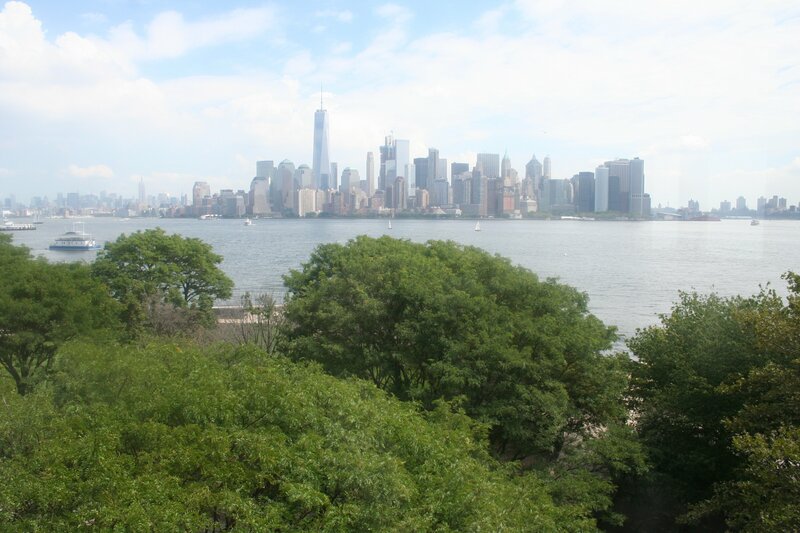 (“There is an evil there that does not sleep…”) In the foreground at the left is our next destination – Ellis Island. 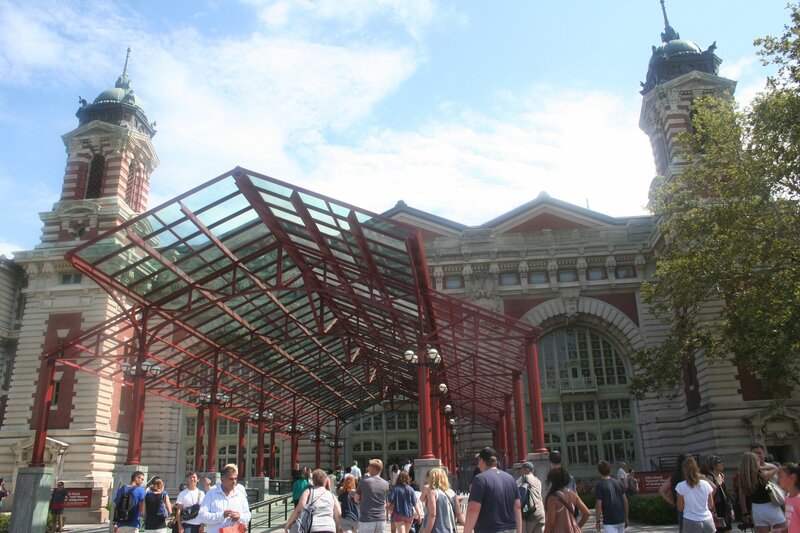 Getting off the ferry from Liberty Island, this is the front entrance to the Ellis Island Museum. 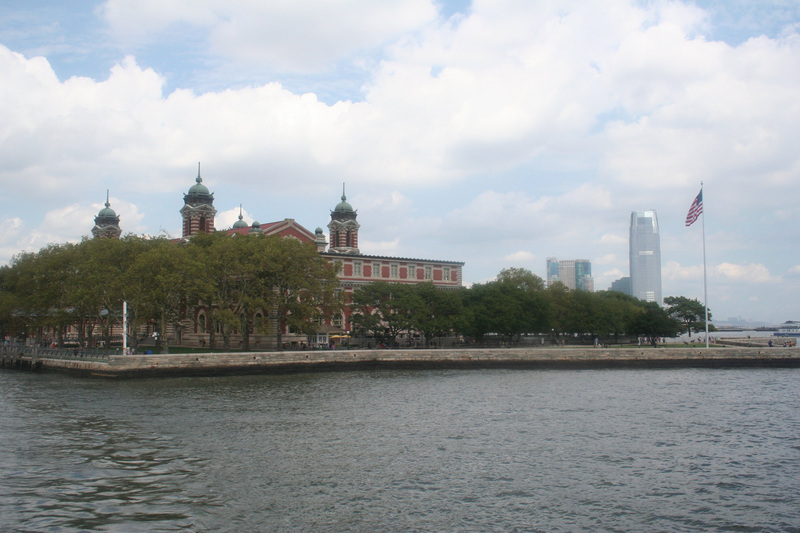 I’ll admit, I didn’t expect a lot from Ellis Island. I knew what it was, we’ve been members for years as supporters, but I figure it was just pretty much a thing to see, check off the list, and move on. 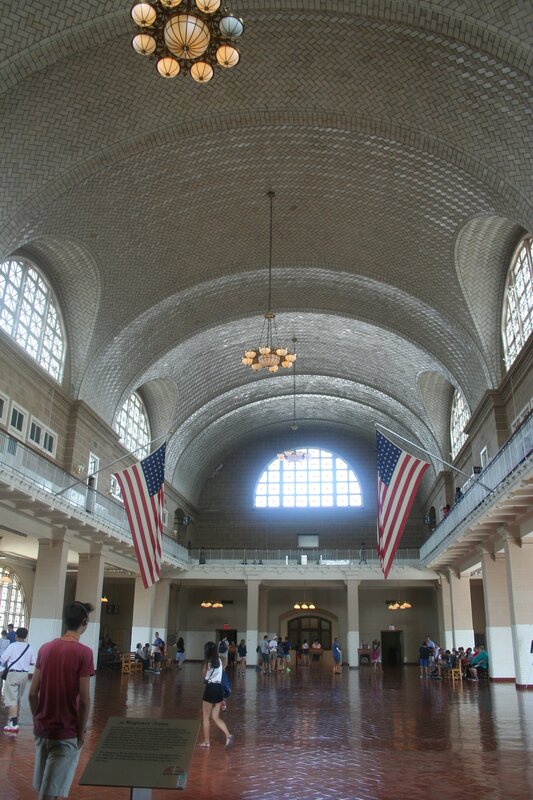 The Great Hall, where millions of immigrants from all over the world entered the United States from 1892 to 1924. It’s gorgeous, meticulously restored to how it looked around 1900. 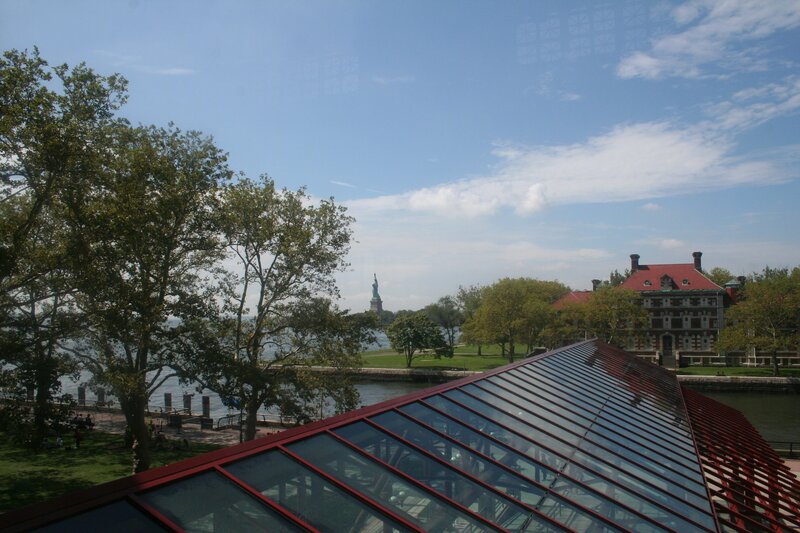 From the museum rooms off of the second floor balcony, you can look out over the entrance, past the dock, and see the Statue of Liberty. As much as it had an effect on me seeing it for the first time, I can only imagine how it looked to refugees and immigrants coming to this country, looking for a better life in a new country. Displays like this were truly moving. The museum does a fantastic job of not just showing you a building, but bringing it to life with stories and pictures. It went far beyond just random displays and artifacts. Here, for example, on the podiums at the far end of the Great Hall, the life & death decisions were made, allowing someone to enter or ordering them to be sent back out of the country. 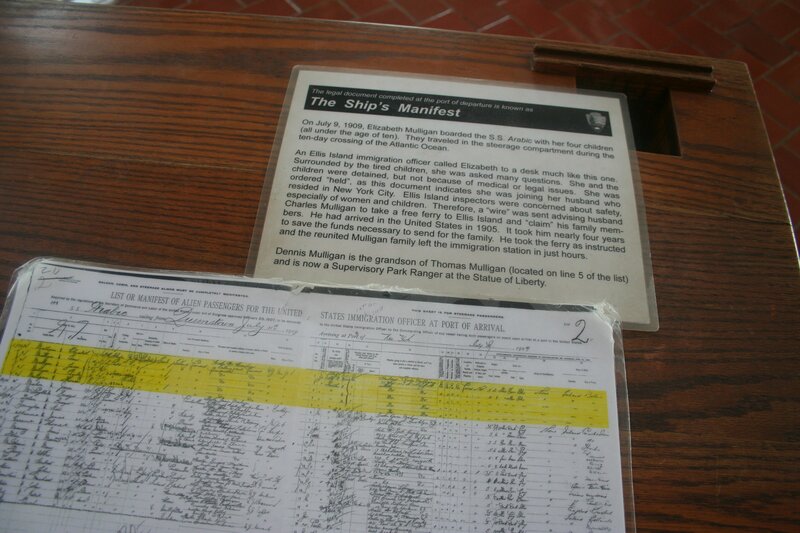 A copy of the ship’s manifest is shown, with the highlighted part showing the entry records for one of the current Park Rangers at the Statue of Liberty. The upper level of the Great Hall, with the display rooms leading off to the side all around. 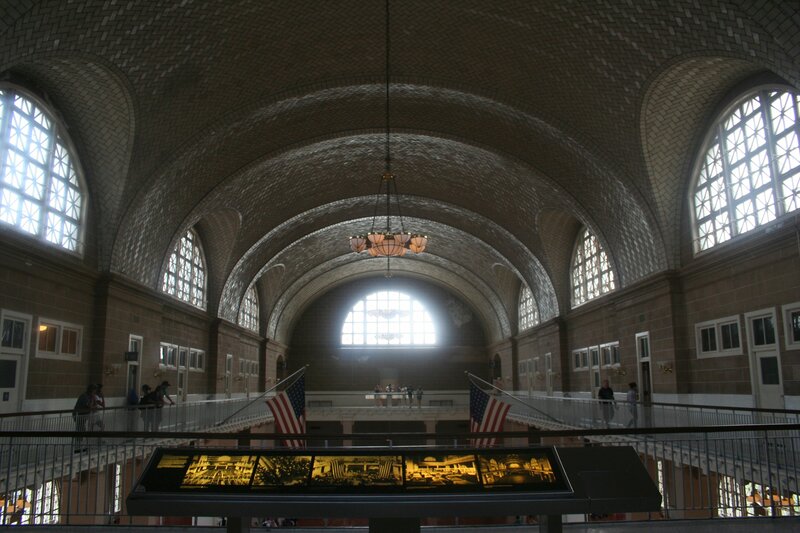 Everything at Ellis Island revolved around the Great Hall. 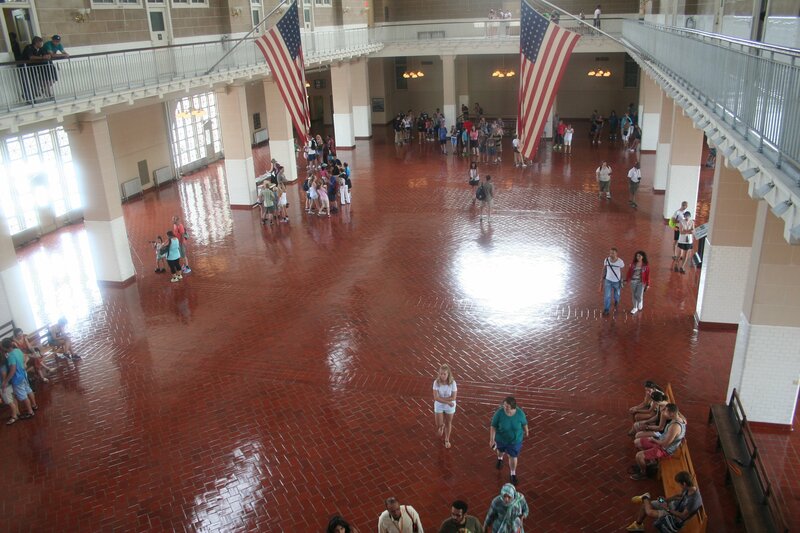 Imagine this room packed to the walls every day of the year with hundreds of families, most carrying everything they owned, most not speaking English, not knowing if they would be let in or what might lie ahead if the were admitted, but know that it had to be better than what they left behind. Looking out the second floor from the side opposite the Statue of Liberty, you see Manhattan. How many of these buildings, streets, subways, trains, and homes were built by laborers who came through this building? Leaving Ellis Island, I know that I’ll be back again, the next time to dig into the displays and exhibits in more depth, when I’m not on a ten-day, how-much-can-we-cram-into-the-trip schedule. This trip was in August 2016, before we got so far mired in our current political situation. Looking back at Ellis Island, then looking at this week’s news, I have to wonder why this country is watching men, women, and children be slaughtered in Syria and other places, while we turn our backs on them and refuse entry. With a visit to the Statue of Liberty first, then the tour of Ellis Island, this was a day full of strong emotions. But the strongest were to come next.